Document Scotland are hitting the road next month. We are heading to the Highlands and Argyll to host the first of a series of four salon events across the country which will present the work we will be showing at our forthcoming exhibition at Street Level Photoworks in Glasgow. There will be presentations in person by Jeremy Sutton-Hibbert, Sophie Gerrard and Colin McPherson. In addition, we’ll be looking at Scotland’s historical legacy by highlighting the work of one of our partner organisations, the University of St. Andrews Library’s photography collection. We’ll also be showcasing work by contemporary photographers making work about Scotland and discussing the current state of photography. Two days later, on Saturday 16th August, the Document Scotland tour takes to the ocean waves, with a three-minute ferry crossing to the small car-free Hebridean island of Easdale, just south of Oban. We are being hosted by Eilean Eisdeal at the Easdale Island Community Hall, a popular and lively venue for all types of arts activities. Our event begins at 7.45pm to accommodate people who may wish to cross over on the ferry from the mainland at 7.30pm. There will be ferries back at the conclusion of the evening’s entertainment. Both events will as usual be informal, informative and interesting – and free to attend. We hope you can join us in either Inverness or Easdale, please spread the word or get in touch for further information. There will be two further salon evening to be staged in St. Andrews and Edinburgh in the autumn. Details to follow. I am very pleased to announce that to co-incide with Document Scotland’s exhibition Beyond The Border currently on at Impressions Gallery, Bradford, The Photographers’ Gallery are selling a special selection of limited edition, archival, signed prints of Drawn To The Land; Women working the Scottish landscape. The selected images are available in 3 sizes and available to buy framed or unframed. Each print is signed by me and you can buy online or by visiting the very lovely Anthony, Gemma and Anstice downstairs in Print Sales at The Photographers’ Gallery. For more information on The Photographers’ Gallery visit their website here, and see more of Sophie’s work and other photographers’ work for sale on the Print Sales page here. Sophie is represented by The Photographers Gallery. Three cheers for the Commonwealth Games. The metal stick aka “the Queen’s Baton” which she kindly loaned-out for a series of global jogs has traversed the old pink section of the global atlas and has now entered Glaswegian orbit after a dash across Scotia’s hills, glens and shopping centres. I remember the 1974 Games in Edinburgh vaguely but can’t remember it being such a big deal as today, so what has changed? Well “regeneration” is now deemed to be the prime reason for this sporting colossus. No more, a chance to find out who is the best lawn bowler in the firmament, this Commonwealth Games is being used as a “once in a lifetime” opportunity to “regenerate” an old and chronically poor section of the Dear Green Place, the Eastend. Olympic cities like Barcelona, Beijing, and London have all used global sporting spectacles to revamp/re-imagine/re-brand parts of the city that were deemed blighted and un-loved. Glasgow has done likewise and so on Wednesday the tv cameras will be sweeping along new boulevards and over shiny metallic sports complexes where once was a mixture of council estates and spare ground. The community of Dalmarnock has borne the brunt of this disruption or regeneration, depending on how you see it, and photographer, Chris Leslie has documented the upheaval and the bitterness that has resulted from this massive change in the fabric of this part of Glasgow. We caught up with Chris recently to find out why he was compelled to shoot this project. Ardenlea St – March 2008. A section of the abandoned flats are set on fire by vandals and are then demolished by the council. Margaret Jaconelli is living next door at the time as the only tenant in the street. Why did you decide to feature this side of the Games? I was studying an MA in Documentary Photography at the time and I had to do a final project over 2 years to submit as part of my MA and at that time I was living in the in Bridgeton, next door to Dalmarnock so when the commonwealth games announcement was made it seemed the perfect project to document and it was a chance for me to finally get round to documenting my home city. What did you know of Dalmarnock before? What surprised you of the area? Despite living round the corner literally, I knew nothing of Dalmarnock, and to be honest no-one in Glasgow knew anything either. I spent the first few weeks wandering around photographing the empty landscapes – but there was in many ways nothing to photograph! The place was empty but there was a buzz in the air that something, everything was going to change – so I persevered and kept wandering and researching. How were you received by community members? The first person I actually met and spoke to was Margaret Jaconelli. I didn’t even notice her at first as I was photographing the empty and partially destroyed Ardenlea St. I heard a wee voice shout hello and when I looked again I see this wifie hanging out her window. I chatted with her on the street for over 2 hours and she told me her story and her pending fight against eviction. I went on to document Margaret’s story for over 3 years as she was finally forcibly evicted from her flat in March 2011. As well as Margaret I also photographed and interviewed some of the Dalmarnock youth and spent some time in the community centre with the pensioners. The youth were happy with the chance of work, lots of apprenticeships were being offered – although no-one at any stage seemed to be offering them the chance to be managers or engineers – it was as if there was a certain level of expectation placed upon them and the area. The elderly population was just glad that after 30 years of decline that something was finally going to change, but they continually reminisced about the good old days when Dalmarnock was once a thriving community. March 2011 – After a four hour siege and enforced eviction by around 100 police and sheriff officers, Margaret and her husband Jack are finally evicted from their home. How is Dalmarnock’s future looking? Will you continue to photograph there after the Games? After 30 years of post industrial decline, poverty, depopulation and general misery Dalmarnock is of course looking reborn with the athletes village and sports arena’s and so on. But you could have plonked a brand new shiny Tesco’s in the middle of Dalmarnock and that would have welcomed with open arms because the area was in such a state for years. It would be good to go back and revisit some people post Commonwealth Games to see what has changed for them. A before and after set up of the built environment would be good also, but a real headache to work out as old Dalmarnock doesn’t exist anymore, even the roads have changed. For now there is a lot of speculation and complaints about the security fencing around the area, but that for me is not a big story because if you look around, most of Glasgow is in lock down it seems for the games and these fences and restrictions will be gone in a matter of weeks. But for me what will be more interesting is looking longer term at the proposed legacy of the games, and to see if anything has actually benefitted the local population as surely that would be the whole point of transforming one of the poorest and neglected areas in the country? April 2008 – Dalmarnock lad – Tony stands amongst the rubble of the demolished high rise flats in Dalmarnock. He offers me a piece of priceless ‘Dalmarnock Rock’ as a souvenir as the land in the area begins to be sold off and cleared to make way for the games. Margaret Jaconelli fought a long battle against eviction from her home in Ardenlea St, Dalmarnock. Here flat sat on the site for the Athletes Village for the Commonwealth Games is to be built in Glasgow. Stone Built by Gunnie Moberg, rebuilt. It was with pleasure that I followed a link on Twitter today, that great oracle, and found out news that a book of Scottish photography is about to be reprinted. Always joyous news here in Document Scotland. Knap of Howar. ©Gunnie Moberg. Great news. 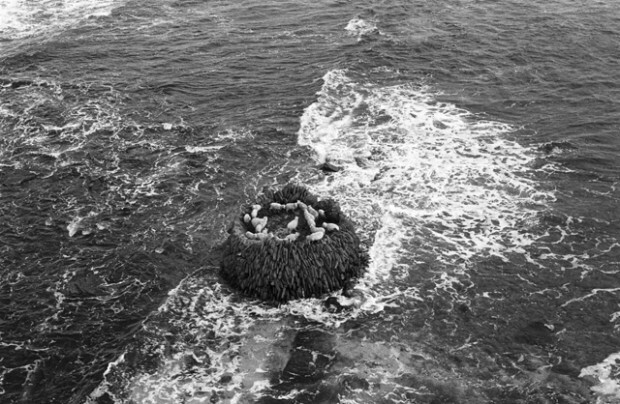 The Orcadian have just published a facsimile copy of Gunnie Moberg’s 1979 publication Stone Built. This book (originally published by Stromness Books & Prints, which in 1979 had just been taken over by Gunnie’s husband Tam) has been out of print for some time. And so it is great news to see this, Gunnie Moberg’s first book, being made available again. This edition has been made using new scans from the original black & white negatives held in the Gunnie Moberg Archive. The beautiful compositions, it transpired, were not achieved through later cropping of the photographs but were there on the neg – Gunnie was a full frame photographer, making her decisions through the lens, and all this hundreds of feet up in a small plane. The Orcadian have included a section at the back which updates some of the information on the sites while leaving the original captions intact. 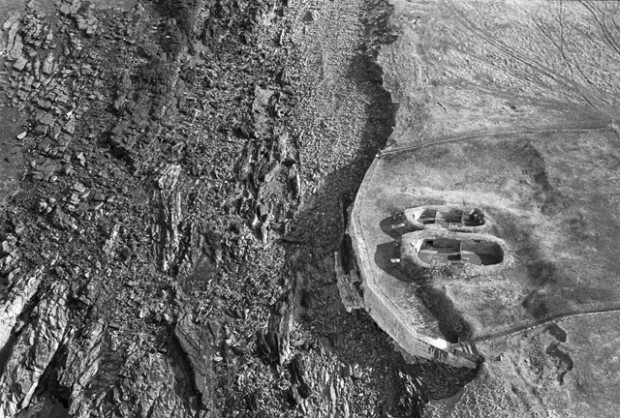 The 18 photographs inside are an aerial tour over some of Orkney’s remarkable archaeology and some lesser known places – one no longer exists, having been claimed by the sea. Gunnie Moberg’s feeling for stone makes this a visual essay on shape and structure. A treasury. A small book of Gunnie’s monumental vision of Orkney. This was Gunnie Moberg’s first book published just three years after she moved with her family to Orkney. 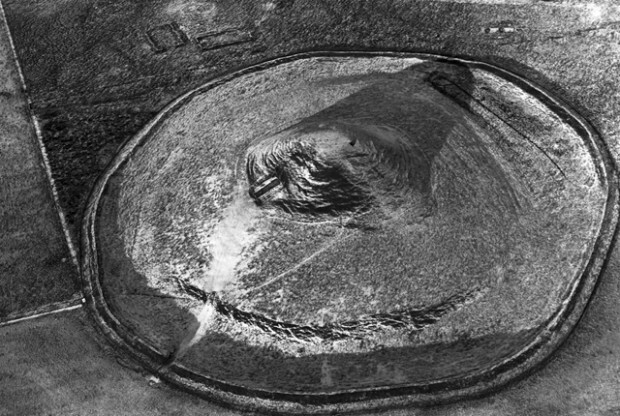 The book is made up of 18 full page black & white photographs of aerial images of archaeology across Orkney. 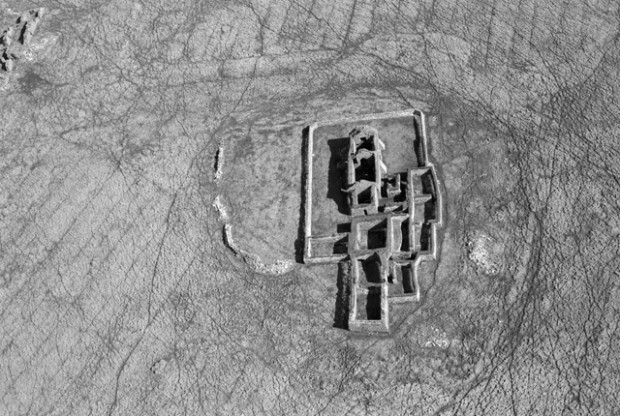 The photographs spread across the islands and across time from 19th Century agricultural buildings to Neolithic chambered tombs. The earliest stone structure is Papa Westray’s Knap of Howar (3,500B.C) and the latest is the WW2 Churchill Barriers. The photographs were shot on 35mm Ilford HP5 and FP4 film. In the acknowledgments Gunnie thanks Andy Alsop the pilot who flew Gunnie around the islands in the Loganair small Islander plane. 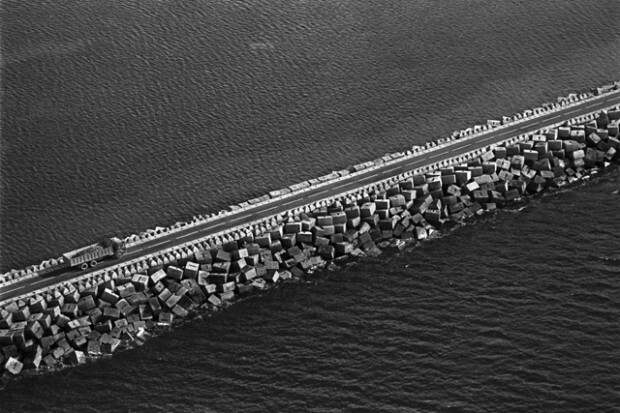 To find out more about Gunnie’s aerial photography visit here. Stone Built is available now through The Orcadian bookshop and Stromness Books & Prints priced at £7.99. Ferryman, Easdale island, 1989. Photograph © Colin McPherson, all rights reserved. Document Scotland’s 2014 programme of salon events are supported by Creative Scotland. Going The Distance is a Street Level Photoworks organised open show and features, amongst others, the work by Document Scotland’s Jeremy Sutton-Hibbert, from his projects ‘Park Run’ and ‘Life In The 3rd’. “Sport, like art, is a universal language, it is part of our everyday lives, and a feature of our society’s diverse cultural life, involving people of all abilities and backgrounds. This exhibition was coordinated to mark the Commonwealth Games in Scotland and celebrates the exceptional and the commonplace in sport. It will tour to other regional venues in Scotland in late 2014 + 2015 as a Games Legacy exhibition.” – Street Level. The show venues, and partcipating photographers are as follows, as well as all work being shown from 13th October – 16th November at Eastwood Park Gallery, Giffnock. A reception was held today at the Harbour Arts Centre to launch the show with talks by photographer Keith Ingham and also Jeremy. Jeremy Sutton-Hibbert’s work on show. Jeremy Sutton-Hibbert’s work from his Rangers FC series ‘Life In The 3rd’ on show. Robin Mitchell’s ‘Into The Blue – Portrait Series of Bowlers’. Keith Ingham tells the story of his work. Jane Stockdale’s work from the Brazil World Cup. Malcolm Dickson (centre) of Street Level Photoworks introduces the show. We at Document Scotland love collaborations! So, when the opportunity presented itself to work together with the Welsh photography collective A Fine Beginning, we jumped at the chance. From ‘Phoenix: the fall and rise of Ravenscraig.’ Photograph © Colin McPherson, 2014 all rights reserved. ‘Untitled’ from the series ‘The Big O’. Photograph © Abbie Trayler-Smith, 2014 all rights reserved. Late last year, we were approached by Malcolm Dickson, director of Street Level Photoworks with the offer of an exhibition at his acclaimed gallery in Glasgow. After much thought and consultation, we decided that we’d like to put on a show which reached beyond Scotland, which was outward-facing and which would allow us to develop projects and ideas in tandem with similarly-minded people. That’s where A Fine Beginning came in. ‘Pink Limo’ from the series ‘Scotia Nova’. Photograph © Stephen McLaren, 2014 all rights reserved. From the series ‘Rutherglen’. Photograph © James O Jenkins, 2014 all rights reserved. Formed in the wake of Document Scotland in 2012, A Fine Beginning (the name derives from the first chapter of Dylan Thomas’ unfinished novel ‘Adventures in the Skin Trade) is made up of photographers James O Jenkins, Jack Latham, Abbie Trayler-Smith and Gawain Barnard. Their burgeoning reputation made it an easy fit: the next step was to bring together diverse themes and ideas and weld them into a coherent narrative: the result is ‘Common Ground’ – which launches at Street Level on Tuesday, 26th August 2014. ‘Untitled’ by Gawain Barnard from the series ‘A Line Runs Through Us’. Photograph © Gawain Barnard, 2014 all rights reserved. ‘Bel Kay, riding side saddle, Peebles’ from the series ‘Unsullied and Untarnished’. Photograph © Jeremy Sutton-Hibbert, 2014 all rights reserved. We don’t want to give away too much at this stage, but we can divulge that the list of projects to be exhibited will take as their inspiration the notion of ‘home’ and ‘community’ and where these start and finish. All the work on show will have been made exclusively for this exhibition and will be seen in public for the first time. In addition to the exhibition itself, there will be a private view on Thursday, 28th August, from 6-8pm. Get in touch if you’d like to come along, we’d love to see you there. From the series ‘Looking for Lilacs’. Photograph © Jack Latham, 2014 all rights reserved. ‘Football goal, Edinburgh’ from the series ‘Sixteen’. Photograph © Sophie Gerrard, 2014 all rights reserved. The following two days (29th and 30th August) will see a range of activities and events which we hope will prove to be interesting and inspirational. There will be portfolio reviews, artists’ talks and the launch of new publication by Document Scotland. More details will be released of how to register to attend these events, please check back on our website soon. We’re pleased to announce that Stephen McLaren will be giving a short talk this Saturday at the Yestival2014-organised Summerhall Salon of photography talks, at Summerhall Salon in Edinburgh, from 1-3pm. Talking alongside Stephen will be photographers Alan McCredie and Alex Boyd, and Sarah Bromage of the Scottish Political Archive. You can reserve a free ticket here. The opening evening of Beyond The Border at Impressions Gallery in Bradford on Thursday 3rd July was a great success, thank you all so much for coming. We were delighted to see so many new and familiar faces there, enjoying the photography, the conversation, the wine and of course, the Tunnock’s Caramel Wafers. Document Scotland would like to thank Anne McNeill, Director of Impressions Gallery, for curating this exhibition and working with us on this project over the last year. We’d also like to thank Annie Lyden, International Curator of Photography at The Scottish National Portrait Gallery for opening the exhibition for us. Thank you all for your kind words, your help, and for the speeches on the opening night. Thanks also to the team at Impressions Gallery for their hard work and to New Focus who interviewed us for a short film of the exhibition, details of which will come soon. There will be a portfolio reviews and a talk with Sophie, Colin and Jeremy on Saturday 26th July – more info and booking here. The exhibition is open until the 27th September, we do hope you can make it along!